Quick post incoming. I’m hoping to have a write-up later tonight diving into the bracket a little bit deeper. 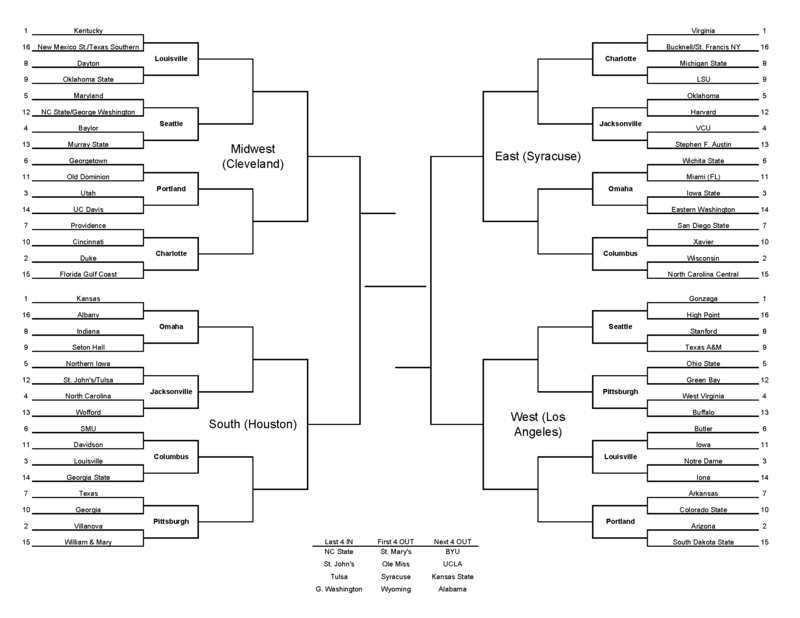 Bur for now, here are the links to today’s bracket, as well as the usual seed list, bubble teams, and conference breakdown. And as always, check out The Bracket Matrix. Quick post incoming. Here is today’s bracket heading into this weekend’s games. I’m going to have a write-up later today on a couple things that I noticed while building this bracket, as well as some interesting tidbits if this was actually the bracket on Selection Sunday. I will also preview a handful of the biggest games this weekend that will have a major impact on the next bracket release. It’s about that time, folks. We are officially less than two weeks away from Selection Sunday and being able to stop all this Bracketology nonsense and instead move onto actually filling out the bracket. But until then, the projections must go on. Also of note, usually on Monday morning, we have our Stock Up/Stock Down report on who helped and hurt themselves in the eyes of the committee in the past week. Due to time constraints and the actual job that I get paid for, that post will go up on Monday night/Tuesday morning instead. Before we get into the bracketology, let’s take a quick look back. This weekend, 11 teams ranked in the Top 25 went down. You would think this would create a lot of movement in the bracket, but when 11 of the Top 25 teams go down, there’s not always someone there to climb to steal another’s spot. This is exactly the situation with the final number one seed. Syracuse lost handily at Virginia on Saturday. It looked like Kansas was in prime position to swoop in and take their 1-seed. But then the Jayhawks went down on Saturday night in Stillwater against Oklahoma State. So who is the final 1-seed? I’ve still got Syracuse. You could also consider Kansas, Wisconsin, Duke, and Villanova. All five are legitimately in play right now. Like I’ve always said, which is the case most years, let’s not get too worked up about who gets the little “1” next to their name? It’s an accomplishment, yes, but in all actuality, it means nothing. Yes, a team that is a 1-seed is more likely to make the Final 4 and win the national championship, but that’s not because they have a 1 next to their name. It’s because they’re a very good team. If Louisville of 2013 or Kentucky of 2012 were 2-seeds, would they not have won it all? It’s hard to imagine that being the case. They won because they were terrific teams, and they were 1-seeds for the same reason. They weren’t terrific because they were both 1-seeds. So let’s not fret too much over gets that last spot on the top line. Plus, it’ll likely sort itself out on its own with a week left of regular season action left and another week of conference tournaments. Someone will rise above the rest. But before then, let’s take a look at our Monday bracket projection. The link to the bracket immediately follows this paragraph. The seed list from 1 to 68 is below, along with Last 4 IN, First 4 OUT, and Next 4 OUT. Bids by conference is below as well.